Readers, hello, how are you all?! Spring is coming… it’s no longer dark early. Yay! Which means I’m more likely to want to get out and about in the evenings. 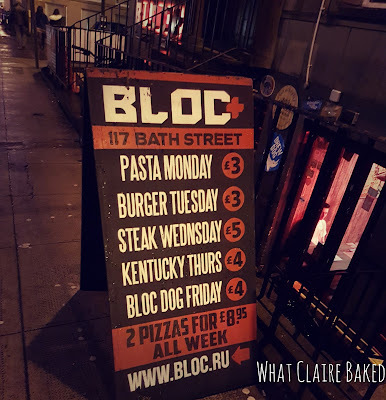 Last Monday, Mr WhatClaireDid and I went to review Bloc+ on Bath Street. For those of you who are unfamiliar, it’s a bar, music venue and food joint rolled into one. There are LOADS of options for vegans and for two meat eaters like ourselves, the burger and hot dog options were endless. Hot tip – go for the tables on the right as you go in, for a good seat if you are eating food. It’s a little more tucked away, but you can still see what’s going on and hear the tunes. 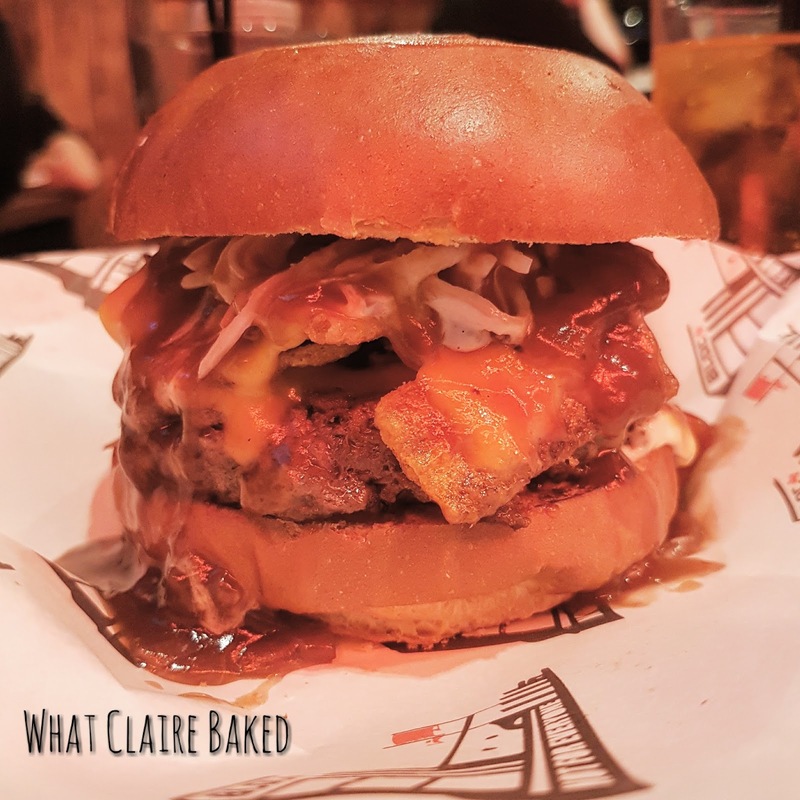 We started off with meat, meat and more meat… I had the Durty Burger, which came with none other than old school snacks, Smith’s Bacon Fries on the top, trailer trash cheese and onion gravy. It was huge. But SO GOOD. If you are going to Bloc, turn up hungry. The food was great. My burger was fresh, loaded with extras and finished on a brioche bun. 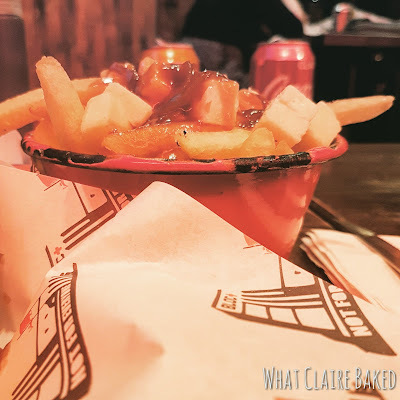 The team also got wired into Scheme Poutine – cheesy, gravy-y, season-y fries. Too much for one, but at £3.50, it makes for a good sharing dish. 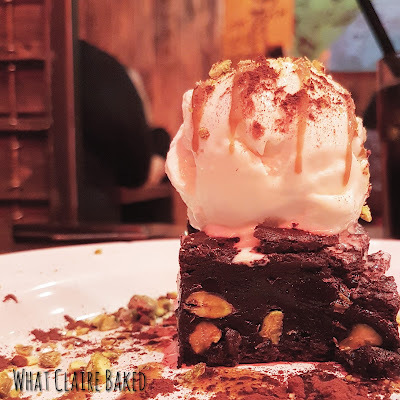 Debating on dessert, an executive (me) decision was taken to share the chocolate brownie with pistachio and chilli. It. Was. Amazing. Warm, gooey and topped with ice cream which is generally how I like my brownie, just in case you wondered. I’d never been to Bloc+ before – but would be back. It had a good vibe for a Monday night, busy at 6.30pm but not rammed. It’s a good shout for after work bites with colleagues (probably ones who are mates, not ideal for a night with the boss), or getting together with friends before you head to a gig. 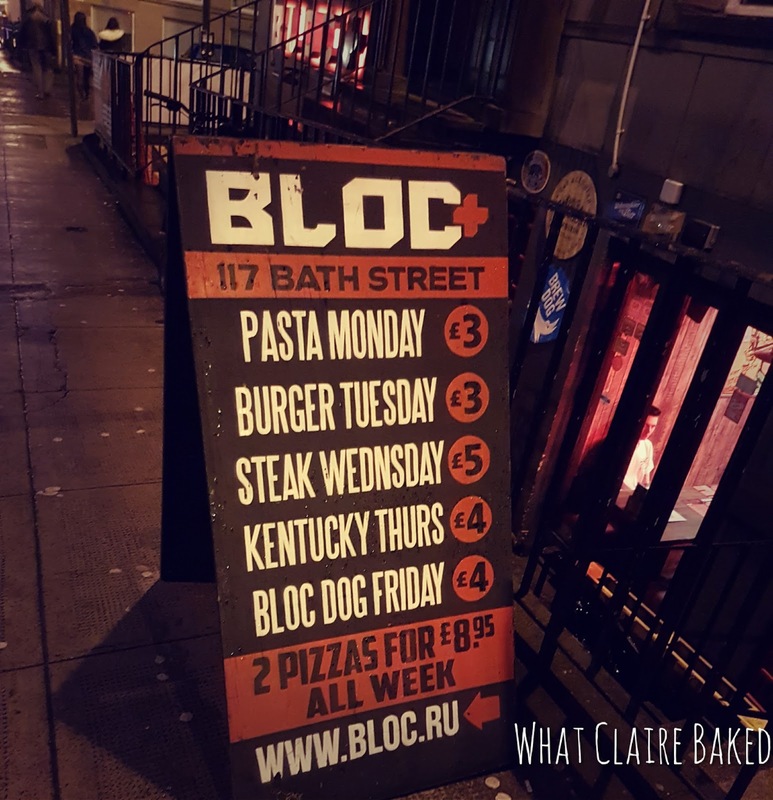 Bloc+’s good value for money. We could have done dinner for two with drinks for around £30. Not bad for a city centre venue. Bloc+ also does deal nights during the week, so for any students reading this, you can go out (not that you needed much tempting, I know). Visit Bloc+ at 117 Bath Street, Glasgow or to find out more about their fun and frolics, follow Facebook, Twitter and Instagram.